Create professional royalty-free autorun (auto-play) CD-ROM menu projects which can be used to launch other programs, training tutorials, presentations, (CBT) computer based training applications, slide shows, brochures, CD Business cards, and ebooks. Create a standardized look for all company CDs with an easy-to-use interface. The optional HTML interface provides complete customization of the end-user interface with clickable links, graphics, and menu options. The end-user interface does not require the use a web browser. Choose from button, HTML, and slide show interfaces. Project files may also be combined into one file for added security and convenience. Your imagination is your only limitation. 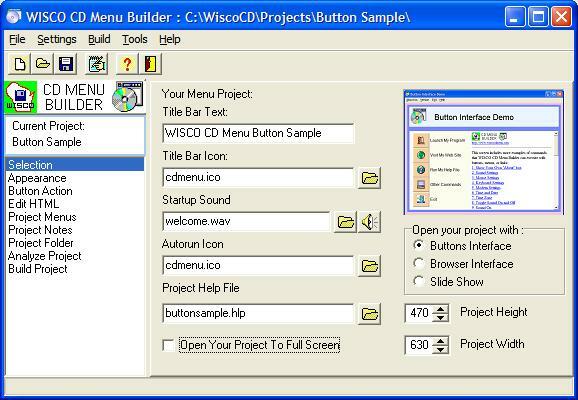 The WISCO CD Menu Builder program is used to create all settings you need to create a project. You have complete control of your project, including the project colors, layout, text, opening sounds, graphics, and functionality. The menu selections, clickable buttons and graphics, and HTML links can start other programs (like installers, demos, and help files) and run many internal commands that can verify and change Windows internal settings.